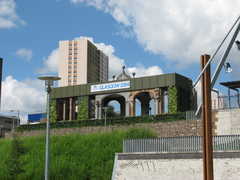 Strathclyde University acquired the former Maternity Hospital, Rottenrow, in Autumn 2001 and the decision was made to create the a social greenspace on the site. The site has since been transformed into a tranquil study spot and meeting place in the very centre of the University campus. The Gardens are named for the Royal maternity Hospital ('Rottenrow') which once stood on the site, serving the people of Glasgow from 1860, to 2001. Rottenrow pioneered research and clinical techniques such as the caeserian which saved many lives and are now used all over the world. 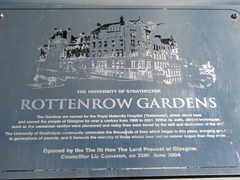 The terraced Rottenrow gardens were designed by GROSS.MAX. Landscape Architects and won a commendation in the Scottish Design Awards 2004. 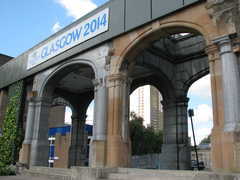 Architecturally important elements of the former maternity hospital, such as the Rottenrow portico and North Portland Street arch were kept in place and incorporated into the overall design. Other masonry and architectural features were also salvaged form the original building and serve to offer a reminder of the great building which once stood in the place and the achievements of those who worked there. Examples include a rock Garden formed from ornamental stonework salvaged from the former hospital building and a wall built from reclaimed sandstone. The gardens were brought into use on 31st October 2003, and as part of the University's 40th anniversary celebrations, the Gardens were formally opened by the Lord Provost of Glasgow, Councillor Liz Cameron, on 25 June 2004. The highest point on the site offers spectacular views out over the garden and glimpses of the Glasgow City skyline. The pergola running E-W on the northern edge visually links the Portico structure to the North Portland arch (as shown). Whilst the gardens have been designed in the knowledge that the University will implement a proareas have been gramme of maintenance that will allow it to flourish, the plants and flowers selected for the gardens were specially chosen to ensure that minimum maintenance is required, yet will provide maximum impact all year round.